Day Four is done. I think we may have figured out who is Grumpy and who is Sleepy today. I don’t believe you have met our crew. There is Corey from Kentucky, Dana from Virginia, Daniel from Israel (that’s right, all the way from Israel), and Jim and I are from Atlanta. Peter and his assistant, Andy complete the crew. We are already good friends. We spent the morning doing nothing but drilling holes in the seat. That may not sound like much, but there are eleven holes drilled at precise compound angles at very particular locations. If you want a good chair, you have to be very careful making these holes. After a lunch break, we started working on getting the legs into the seats. The legs are fitted in tapered holes for strength and they must be set at the correct angles so that when you look at the chair from the front or from the side, the legs line up. It is a fact of making things like Windsor chairs that the eye goes directly to things which are out of line or uneven. If the legs are not lined up, a one-eyed man on a fast horse would ride by and see it and chuckle a little at your ineptitude. You certainly don’t want that so you need to be careful. When we had the legs fitted, we started measuring for the side and front stretchers – a delicate operation. Since this is a “box” stretcher configuration, there is little room for error. If you mess it up, then your work on the legs and stretchers will have been in vain and you might as well give the whole works to the man on the horse. We got all the stretchers cut to size and we will be ready to start drilling holes in the legs in the morning. 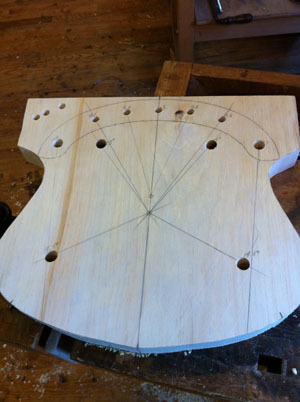 We will also start carving the seats and shaping them to that beautiful delicate shape you can see in all the pictures. We made another full day today and expect to do so again tomorrow. Don’t you wish you had signed up? 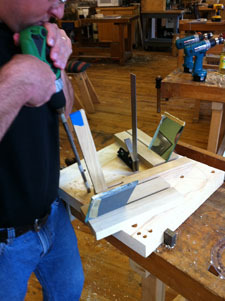 Go look at the schedule of classes on the Highland Woodworking web site and see what you would like to learn. We look forward to seeing you in Atlanta. Maybe I will see you there and put you on the Blog too. 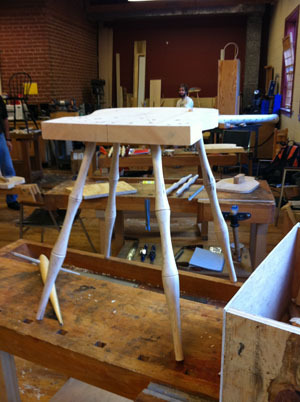 Click here to read about Day 5 of Peter Galbert’s Build a Windsor Chair class.